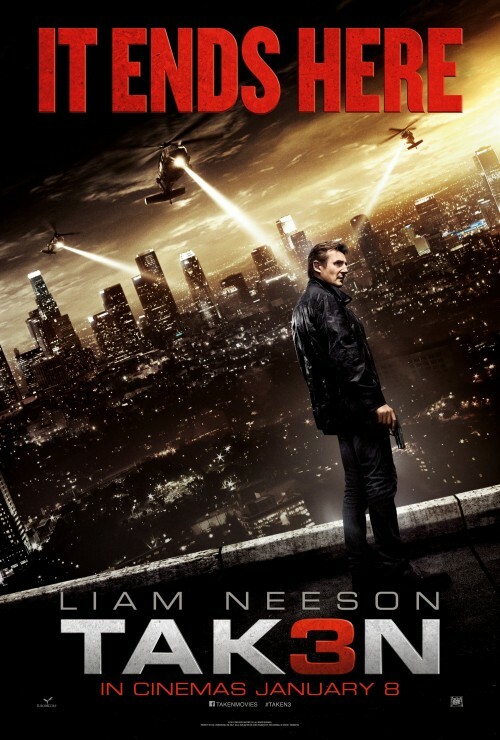 With its stupid name Taken 3, sorry TAK3N, we have been sent over the first trailer for the film as well as the first photoshopped Liam Neeson posters for the film. It’s one of the better jobs as we have seen worse! If, unlike me, you have seen any of the previous films you will know what’s going to happen. This time it seems that this is the last in the Taken franchise as the tag line of the poster seems to hint with It ends here. It started with his daughter being kidnapped, went via his wife, and himself enduring the same fate and ends with someone threatening to kill her. This happens with a side plot of his wife being murdered along the way. The trailer is full of explosions, an interesting use of a defibrillator [don’t try that at home kids!] as well as some car chases, a novel way of crippling a jet aircraft with a Porsche as well as the standard random shooting and escaping from various bad, and good, guys.